We all go through experiences in life that leave us a changed person. 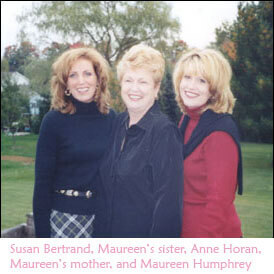 Though my sister Maureen was 7 years younger than I, she was the leader. She was the decisive one and I’m sure her many friends would agree that usually what she decided was right! Her sense of humor was incomparable and she was simply fun. She loved life and lived it to the fullest, putting vacations at the top of her priority list. I remember her telling me a few months before she passed away that if she could live her life over, she wouldn’t change a thing. How wonderful to feel that way! I do believe happiness is a choice and she chose happiness. Maureen was young and healthy, ecstatic with the news that she was pregnant with the child that she and her husband Shawn had dreamed about. 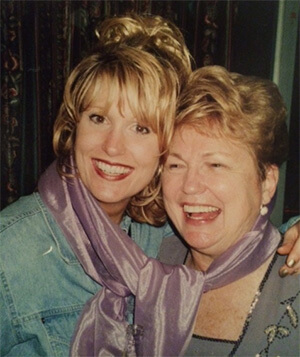 But, on June 5, 2001 their world would change when Maureen was diagnosed with clear cell adenocarcinoma, a very rare and aggressive cervical cancer that starts in your glands. No one ever expects that cancer or illness will happen to them and we certainly felt the same way. Maureen’s cancer diagnosis was a shock, but worse than the diagnosis was the grief she felt knowing she was going to lose her unborn child and never again have the chance to conceive or carry her own child again. She had a radical hysterectomy with 28 lymph nodes removed on June 15, 2001. We thought this was the worst week of our lives, never imagining what lies ahead. Maureen spent the next few months recovering from her surgery and reading about adoption. She was excited when she was able to return to work as the Human Resource Coordinator at C&S Engineering and after much research, she and Shawn decided they were going to adopt a baby from Bogota, Columbia. Maureen knew it would take some time before the adoption would happen, but their dreams of having a baby were alive again. For a short time, life started to feel a bit like normal but, Maureen started experiencing a dull ache in her lower back just after the beginning of the New Year. Though MRI reports and x-rays showed no signs of cancer, Maureen knew that something wasn’t right. The pain continued and she was referred to a neurologist who thought perhaps she had some scar tissue that was causing nerve pain. She was put into physical therapy but the pain continued for months, worsening each week. In April she called her oncologist insisting that she knew something was wrong. They did a follow up MRI and a tumor was evident this time. She underwent surgery to have the tumor removed and had to spend the next five days in the hospital awaiting results. The time spent waiting for results can so often be the worse. It’s such a helpless time. I have to say that Maureen’s spirit would always shine through in the worst situations. My mom and I had taken Maureen for a short walk down the hospital hallway and Maureen noticed an older woman alone in her room. Maureen’s room was filled with flowers and she always had visitors. So, when Maureen got back to her room she picked up one of her arrangements to bring to the older woman. When we approached the woman she was so thankful and asked us if we would do her one more favor. “Certainly” we said. She asked if we would sing with her. So the woman started singing a hymn (which my mother of course knew all the words to) and Maureen and I hummed along. It was such a sweet and unforgettable moment that reminded me how the little things in life can truly make a difference. The results confirmed that Maureen’s cancer had returned and this time it was decided she would receive treatment at Sloan Kettering in NYC. She spoke with Dr. Dizon at Sloan who said that if every medical report, x-ray, MRI and actual pathology report could be delivered to him by the next morning, he would agree to see her by the end of the week. I was on my way to a kindergarten field trip, so instead my mom, who had no idea where she was even going, got on the school bus and Maureen and I got in the car and spent the next 7 hours driving to various medical offices and hospitals collecting all the reports and slides. We then gave it all to my husband Ron who drove it from Syracuse to Utica, where he passed it off to my dad. My dad then drove it all to Albany where he met my brother Garry who hand delivered all of it to Sloan Kettering by 8 a.m. the next morning. Where there’s a will, there’s a way. The team of doctors at Sloan decided to treat Maureen’s cancer with very aggressive rounds of chemotherapy and radiation treatments that she would receive over the course of 3 months. She was admitted on May 6 and began treatment two days later. She would receive one day of Cisplatin and then three days of Flouracil every three weeks as well as radiation every day. The treatments were extremely difficult on her both physically and mentally, and she suffered through almost every uncomfortable side effect except one; she never lost her hair. What a small blessing that was because I must say she had great hair! But the other thing she never lost was hope. Hope was what gave her the courage and strength to fight each day, never giving up. Some days she fought for herself, but I know most days she was fighting for us. I learned what a selfless disease cancer can be. Maureen’s cancer was not fought alone; our entire family was in the ring with her. I think she was very proud and comforted that she never spent a moment alone during her entire stay at Sloan. 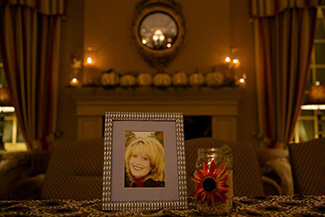 The love and support she received from family and friends truly brought her through each day. It was a very difficult time for my parents as well, who spent most of the three months in NY, but there was no place else they would have rather been. It wasn’t the geography that made it difficult; it was watching their daughter suffer through these horrible treatments. Any one of us would have done anything within our power to save her life, but so much was just out of our control. Shawn was able to come down on the weekends and my brothers and I would get there as often as we could. When my brothers would arrive at the hospital, they didn’t walk into the room quiet and reserved. They walked in like they just arrived at a holiday party. Maureen loved it. I remember Maureen’s first week spent at Sloan; it was a difficult time but Brian, Garry and I were able to spend the entire week with her. They would come to take her for an x-ray and there we would all go. I must add that we were not an unnoticeable group either! We were able to find humor in most situations, continue to make new memories and talk about our dreams for the future. Maureen still spoke of the baby she hoped to one day adopt. Without dreams we truly cease to exist. Maureen was home for a short time after she completed her treatments, but life was still a roller coaster ride. In October she found out the cancer had spread to her colon and the doctors in Syracuse felt there was nothing more they could do except palliative care, so again we headed to Sloan. We met with a surgeon, Dr. Sonoda, who specialized in woman’s gynecological cancers. He had spent a year abroad training in France and was known to be one of the best surgeons in the country, though he was young. We discussed Maureen’s options and Dr. Sonoda felt that because Maureen was young and strong, she might be a good candidate for a pelvic exenteration. It was a very risky surgery that would involve 5 surgeons and take up to 16 hours. They would also do internal radiation at the site where Maureen’s tumor was, which was a new procedure they were offering at the time. Without hesitation, Maureen wanted whatever might offer her “the cure.” He asked if we had any more questions and Maureen said “Yes, I understand you’re one of the top surgeons at one of the best cancer centers in the world, but how old are you?” (I almost spit out my coffee!) She proceeded to say “If I’m going to have this surgery done, I want the best. Are you the best?” My mom and I were pinching each other under the table, but I was also thinking “Go Maureen!” He proceeded to again offer his qualifications to Maureen and by the time we left I could tell there was mutual respect. She did deserve the best and it was decided that Dr. Sonoda would perform the surgery. Maureen came home and had to spend the next three weeks before her surgery on a liquid diet. The tumor was blocking her colon and she was unable to eat anything solid. She lived off of chicken broth, jello and gatorade. Never once did she complain – not once. I honestly don’t know if I could do that for one day. Her surgery was scheduled for October 28 and I think this trip to Sloan was the most difficult. We drove down to Garry’s house and spent the night there and then drove together into the city in my van. I can’t imagine how Maureen must have felt, but I was the one who got car sick in the van and had to throw up! How ridiculous! Again, it was something to laugh about. My parents, Shawn, Brian, Garry and I were all there as they wheeled her into surgery. Everything was out of our control and we could only rely on the doctors and our faith. The surgery lasted 13 hours and again, the waiting can be the worst. We just wanted to be with Maureen and know she was okay. I’ll never forget how I felt when Dr. Sonoda entered the waiting room. His face was imprinted with the lines from his face mask, his head was covered in sweat and he spoke with compassion and with confidence. The surgery went very well and all of the biopsies for distant metastasis came back negative. It was wonderful news, we had hoped. This good news carried us through the next few weeks, but Maureen was not getting better. Her body was weakening, her appetite was diminishing and she was fighting an infection. During the Christmas season, sometimes when Maureen was sleeping I can remember going for walks outside in the city and seeing all the people going about their day, doing their shopping and rushing to their next destination. When I would go back to Maureen’s room she would greet me with a smile and ask if I found any good bargains. It broke my heart because I felt she was missing out on so much. But, I can tell you with all sincerity that she had a very peaceful contentment. Her faith was strong and I could feel it – I knew it. Inside and outside the walls of the hospital were two different worlds. What I learned on the inside was compassion and the true meaning of courage and faith. I learned to believe in miracles. Maureen’s belief in miracles nourished her hope and she wouldn’t have had such faith in miracles if they didn’t happen every day. She taught me so much. After having exhausted all their efforts to cure Maureen, on January 3, 2003, her team of doctors at Sloan Kettering told her with tears in their eyes, that there was no further treatment they could offer her. She was just too weak physically. Maureen turned to them and said, “I am so sorry for you all as well, I know how badly you wanted to cure me.” She had as much empathy for them as they did for her. 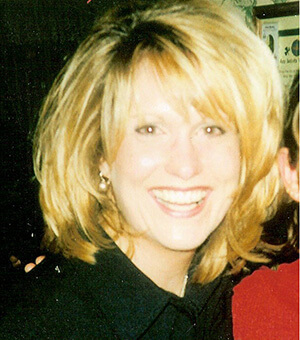 Maureen passed away at home on January 19, 2003 at the young age of 31; we were all with her. In my last words with her I was holding both her hands and I said “Maureen, no matter what road this journey takes you down, I promise you will be okay.” She looked at me and said “You think I’m going to be okay?” I said “Yes, I promise.” I know Maureen is at peace and that she is okay. 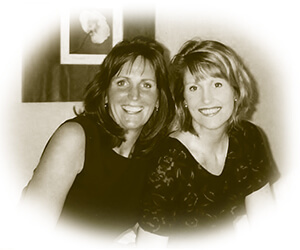 I was so blessed to have Maureen as my sister and my best friend for 31 years. I can’t let go of what she taught me or how she made me feel and that is what brought me to starting Maureen’s Hope Foundation. Maureen’s work is done and mine has just begun. Let’s pass it on!